Having survived the Apocalypse, our show today features the work of Goldhawk Productions, lead by John Dryden, a Sony and Peabody Award winning radio producer whose work is regularly commissioned for BBC Radio 4. The show transposes Charles Dickens’ satire on the corrosive power of money to the hot, hectic streets of modern-day Mumbai, India. In it, the miserly old recluse Martin Chuzzlewit adopts an orphan girl, Mary, to be his caregiver. As she will inherit nothing upon his death, he believes she will do her utmost to keep him in good health. But when Chuzzlewit’s grandson Mickey falls in love with Mary, Martin’s plans are thrown into disarray. Disinheriting him, Martin triggers a complex web of deceit, betrayal and manipulation as the extended family and hangers-on close in, in pursuit of his fortune. This fast-paced drama full of intrigue, romance, suspense and murder is told in three hour-long parts, and you, dear Radio Drama Revival listener, will be able to hear the story in its full, unedited glory, for the first time it’s been heard outside of the BBC. 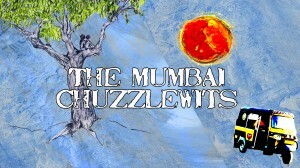 Today we’ll hear Part 2 of 3 of The Mumbai Chuzzlewits.